I only have four more exams left for the term! It's great to have the end in sight, though there was some guilt as I told the kiddos that mommy was not going to get to play until Wednesday. They will be so thrilled to have me back, even now as I write this, my son is curled up and sleeping next to me on the couch. In the midst of all of this test prep to become a DC, I took a ride out to the Rustic Road Farm about a half hour drive west of campus in Elburn, Ill. to order my seasonal crop share. Self-care week is here! For at least the last year or so, Week 13 has turned into self-care week. Student clubs and some faculty host events and talks-all with the focus of taking care of yourself, so that you can take care of others. Activities include everything from Tui Na massage, to Tarot Card reading, giving students the opportunity to reset their brains before the last push of studying begins. I've been saying it all term, but really, where has all the time gone? With the craziness of the snow days and holidays, time just seemed to fly. This was the first weekend in a while that I haven't had to work, go to a seminar, or do anything else besides study; and there is always studying to be done. Clerkships are a course of clinical medical training usually lasting a minimum of several weeks that take place during the third or fourth year of medical school; they typically allow the participant a chance to learn a specialty. When you get to the clinical stages of your education at National, there are some opportunities for positions outside of the school clinic to pick-up clinical skills. Those in the chiropractic program can apply to work in a few different VA hospitals and at the Medical College of Wisconsin. To get to participate in one of these programs you need to apply and fulfill any of the additional requirements that the program has for admission. Continuing Education Seminars - Don't Miss Out! One of the awesome things about being a student is that you get to pay the "student" rate for a whole bunch of post-graduate seminars! Our Post-grad Department sets up a wide variety of extra learning opportunities, because once you finish school you need to stay up-to-date with all of your continuing education units. If you choose to come to our campus in Lombard, Illinois, you are almost guaranteed to end up with a snow day. So far, this trimester was a lot more like a snow week, as full and partial days of classes were canceled due to the frigid temperatures. That's Chicago area weather for you, 70 degrees of temperature change in less than seven days. While you are a student, the last thing you might be thinking about is being involved with The Alumni Association. I mean that's for graduates right? Well, our Alumni Association does some great things for students, too. Hooray for finals…just six tests away from "freedom"! Aaaand I got sick. Happy Thanksgiving student blog readers! We have reached that point in the trimester where I find that I have been looking forward to a little time off. Veteran's Day seemed like it could be my chance; unfortunately, the problem is that when given time I quickly find ways to fill it. So, I kept busy, and will continue to be busy right up until the end of my last clinic shift during finals week; the tests don't ever seem to end this term. I do get one more chance at a little break for Thanksgiving though and we will see how that one goes. 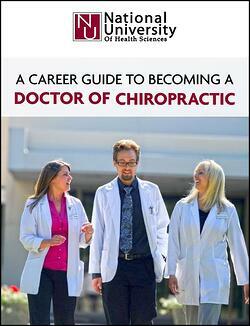 Interested in learning more about a career in chiropractic medicine? Check out our guide!